We were discussing the first law of thermodynamics in our previous post. There were some limitations in first law of thermodynamics. We will discuss these limitations and simultaneously we will discuss the second law of thermodynamics in this post. 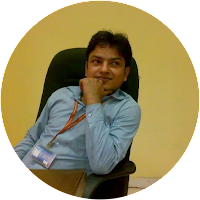 We have seen in first law of thermodynamics, energy transformation through the system will take place in the form of heat energy or work energy. First law of thermodynamics has not provided the information that how much quantity of complete energy of the system will be converted in to the work energy. First law of thermodynamics has not provided any information about the conditions in which conversion of heat energy in work energy is possible. First law of thermodynamics also does not specify the direction of heat transfer. Let we have two objects, one is cold and second one is hot object. If we are making contact of hot object with cold object, what will happen? Heat energy will flow from hot object to cold object and therefore hot object will be cooled down and cold object will be heated up and this transformation of energy will take place till equilibrium achieved. Suppose, if heat energy flow take place from cold object to hot object. If our assumption exists, hot object will be hotter and cold object will be colder or we can say that energy will be conserved. Our assumption of heat transfer from cold object to hot object follows the law of conservation of energy and first law of thermodynamics is not violated here. But, are you agree with the assumption of heat transfer from cold object to hot object? Your answer will be no, because we have not seen such an example to be possible naturally. But second law of thermodynamics explains the direction of heat transfer between two thermal reservoirs and also explains the conversion of heat energy in to work energy. 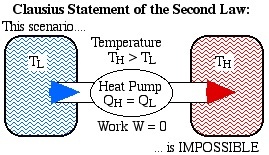 Clausius and Kelvin- Plank proposed second law of thermodynamics. Clausius statement and Kelvin- Plank statement for second law of thermodynamics slightly differs in words but both statements are basically equivalent. In simple words, for transferring heat energy from an object at a lower temperature to an object at higher temperature, some external work must be done on the system. Without any external work on the system, it is not possible to transfer the heat from an object at a lower temperature to an object at higher temperature. 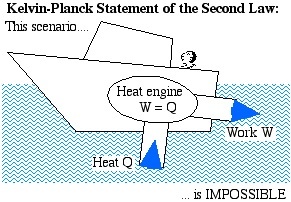 Kelvin- Plank statement for second law of thermodynamics is based on the concept that a heat engine can never be 100% efficient. 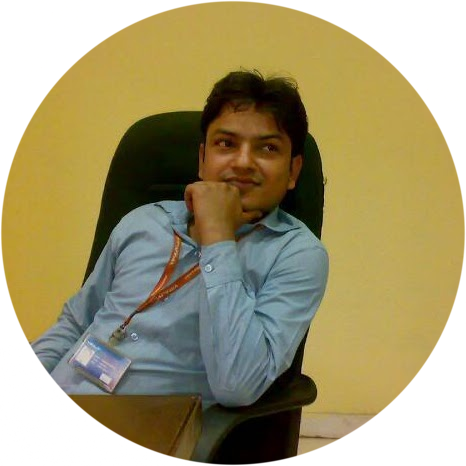 Or we can say that heat engine will be operated between two thermal reservoirs of having different temperature for producing the work and 100% heat energy will never be converted in to work energy but also some heat energy will be rejected to lower temperature reservoir. Clausius statement and Kelvin- Plank statement for second law of thermodynamics slightly differs in words but both statements are basically equivalent because if a system violates Clausius statement then Kelvin- Plank statement will also be violated. We will continue our discussion with perpetual motion machine of the first kind and second kind in our next post.